Interpolated zooming is a great feature, making everything look nice and smooth. But for small images it's annoying. Images such as pixel art, icons, thumbnails, etc. All the pixels blur together and you can't see the image clearly. I would like to suggest that interpolation is disabled for images below a threshold of (say) 500 pixels wide. It would also be good to have an option to customise this threshold, though that is less important. Yes, I have "fit image to window" enabled, so small images always open zoomed in. 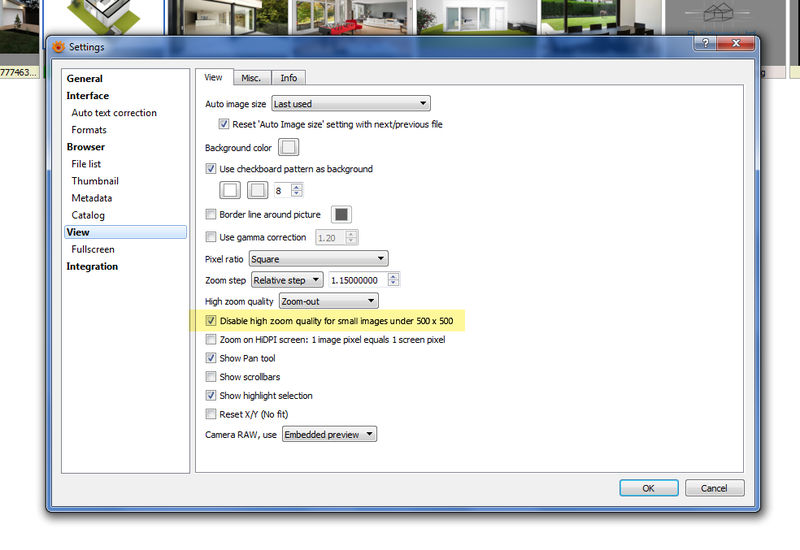 There is an option Tools > Settings... > View -- View tab : High zoom quality which may be what you need? Setting this to "Zoom out" does prevent small images from being interpolated - but it also stops ALL medium resolution images from being interpolated! The problem is even worse for me because my monitor is 2560 x 1440, which means that most photos get zoomed in. I want all images to be interpolated except small images (less than 500 pixels). … Or it would be great to simply have a button to toggle interpolation on/off! Yes please, if possible! Ideally a key that could be pressed, but a I suppose an option in the menu may be useful so that people know they can do it?